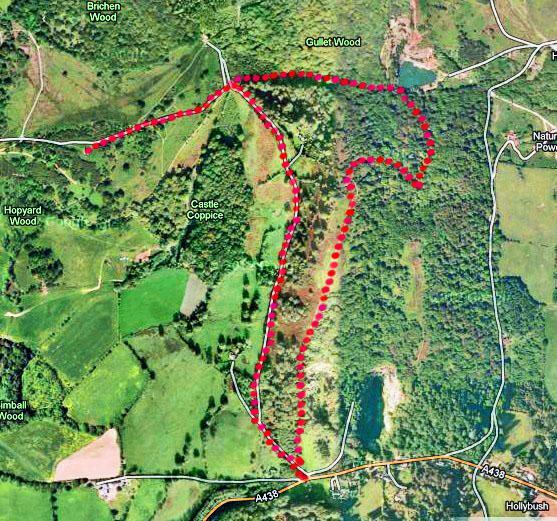 This is a great little walk for the whole family, so pull on your boots and pack a picnic. The walk includes a short climb, but nothing too difficult, as the view at the top will be well worth it. 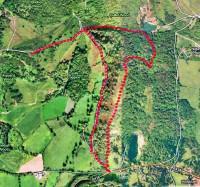 The distance is only a mere 2.5 miles (4km) and features easy lane and path walking. Other than the one short climb, it’s an easy stroll and should take about one and a half hours at a moderate pace (more if you picnic at the summit). Unfortunately there are no toilets along the route, so you might have to nip it! The trail starts in the Eastnor Castle Estate car park, Hollybush. If you are using public transport, then no worries, take the ‘Hills Hopper’ circular bus service to Hollybush from Malvern and Ledbury. From the parking area join a narrow lane on the left, cross the cattle-grid and start a gentle easy ascent. At a bend, you’ll see that the views open up on your left across Eastnor Estate, encompassing the magnificent Eastnor Castle sitting quietly on the wooded lower slopes of the Malverns. Stay on this lane for a while; you’ll pass an isolated cottage and the path will roughen slightly. You’ll pass through a gateway and the path will drop to a junction of tracks beside a tall gate. This is the perimeter of the deer park, hence the tall gate. Go through the tall kissing gate and you’ll find yourself standing before three tracks: take the middle one. This track will climb gradually to reach the Obelisk, an eye-catching feature at the heart of the park. This strange looking monument was built in 1812 and is a memorial to the son of the first Earl Somers who was killed in the Peninsular War. After exploring the obelisk, head back up to the tall gate and take the wooded track opposite it, signed for Gullet car park. This is a short track and you’ll be there in no time. Have a look at the huge blasted rock faces, cut from some of the oldest rocks in Britain, estimated to be over 600 million years old! With your back to the quarry wall, head towards the low sign banning wheeled vehicles. To the right of this you’ll see a wide path heading up into the woods. Take this path. It might seem steep at first, but it eases out after a while. Make sure you stay on the path, don’t be side tracked with any off-shoot paths. This main path follows the line of the Medieval ‘Shire Ditch’ boundary of the Bishopric of Hereford. This path eventually reaches a T-junction at the end of the woods. Go right at the junction along the grassy path and then turn left to reach the summit; you should see the path going up. This is Hollybush Hill, one of twin summits of Midsummer Hill. This is one of two such forts on the Malverns. You’ll notice the views are really quite breath-taking, you can see 50 miles on a clear day. Look west to the Black Mountains and Brecon Beacons, South to the Forest of Dean, East to the Cotswolds and North to the Clee Hills. From the summit, head south passing by a shelter to pick up a well-walked path down through the fort’s corrugated ramparts. Here you’ll enter woods that fall gently down to the car park.